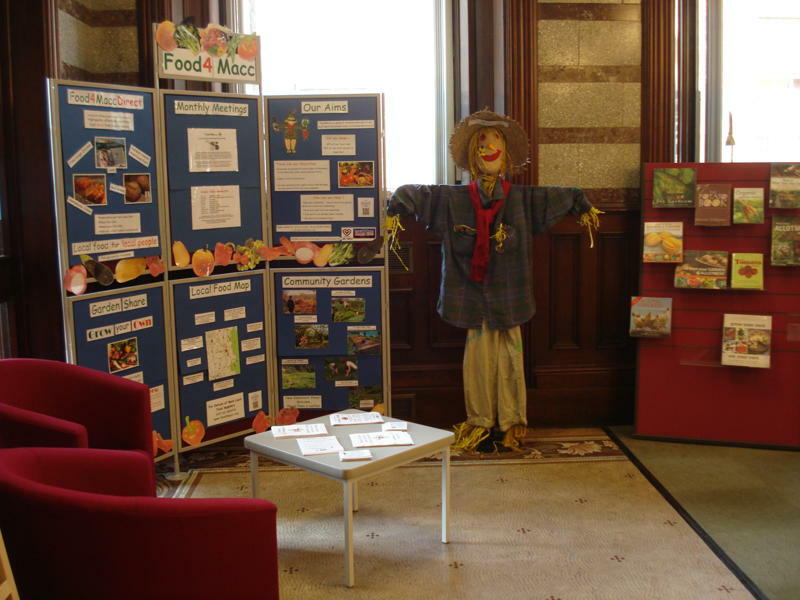 Food4macc is an organisation promoting local food growing in Macclesfield to make food supplies resilient to Peak Oil and Carbon Reduction. Many of the objectives of the Transition Town movement are shared. 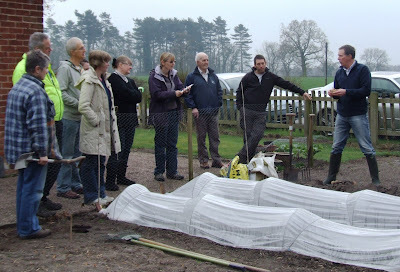 Yvonne Phillips persuaded her husband Peter, Head Gardener at Capesthorne Hall to generously give up his morning last Saturday to host "Growing in Confidence", a demonstration of seed planting for beginners. 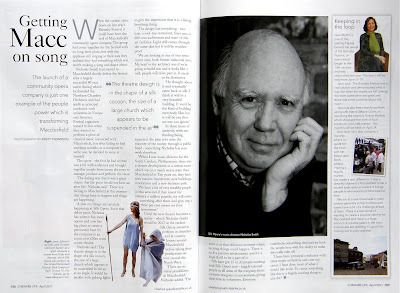 This was followed by tea and home-made cakes by Yvonne. After a complete redesign by Judy Roper, Ruth Shercliff and Debbie Townend, our display boards have returned to the foyer of Macclesfield Libray until Saturday 2nd April. 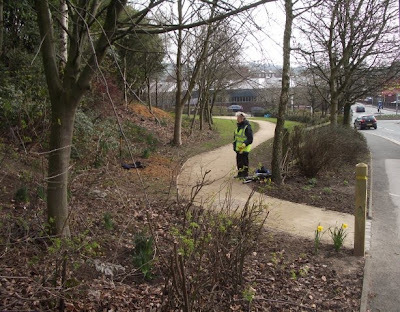 Have you noticed the new path alongside Churchill Way opposite B&Q and Halfords? The Macclesfield Guild in conjunction with CEC have begun work on creating an attactive green space out of what was for many years a piece of derelict land. 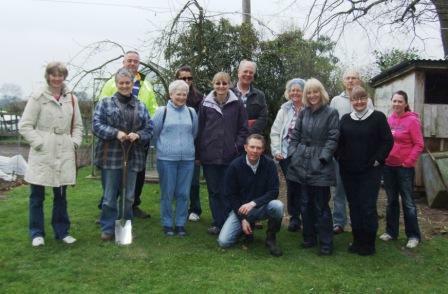 Val Lloyd is shown here planting daffodils beside the path. If you have half an hour to spare, you can help by removing litter from the bushes at the top of the slope. If you have some plants that you would like to place there, give Eric or Val a call on 01625 511 408. They would welcome some help! 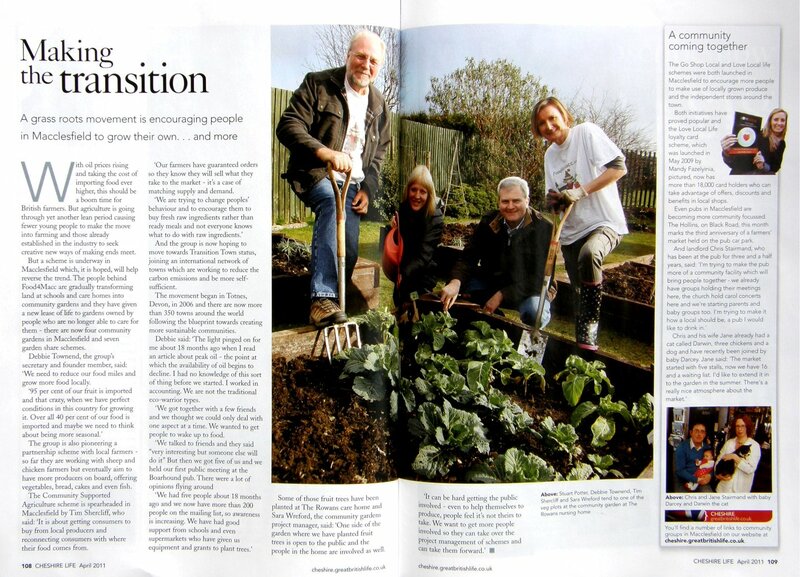 The April edition of Cheshire Life contains a feature on "People power transforming Macclesfield." The article includes references to Transition, Food4Macc, Treacle Market, The Loop, Love Local Life, and the Farmers markets held at the Hollins pub, and the community opera.